The sun is shining, and it is starting to feel like Spring! This is the time of year where sunshine and newly bright, fresh weather invites us to refresh and re-invigorate our internal spaces with some Spring Cleaning. The very first step in Spring Cleaning is to remove clutter in order to create space, you can’t vacuum or dust while every surface is covered with stuff! The same can be said for our bodies and minds: in order to refresh and renew, we must first create space by Letting Go – Our theme for April. In our Asana practice, we are often encouraged to practice letting go with each exhale. Releasing the tension in our bodies , and the attachment to the thoughts swirling through our minds, helps creates space so that we can become aware of of, and connect to, our embodied experience. Truly feeling our breath and connecting to the subtle wisdom of our bodies cannot happen unless we release something first. Off the mat the same wisdom applies; new habits cannot take hold if old ones are holding fast, and new ways of being in relationship cannot flourish if old roles and behaviors are entrenched. If our thoughts, behaviors, or relationships are no longer serving us (or no longer “sparking joy” for you Kondo Fans 😉 ) we can consciously release them, thank them for their service, and let them go. But letting something within us go is different from throwing away. Unlike with our possessions, releasing the stories that have grounded our understanding of who we are in the world, or the habits that have served us for years, or the relationships that were once supportive – can be challenging and scary – requiring effort and trusting in the unknown. 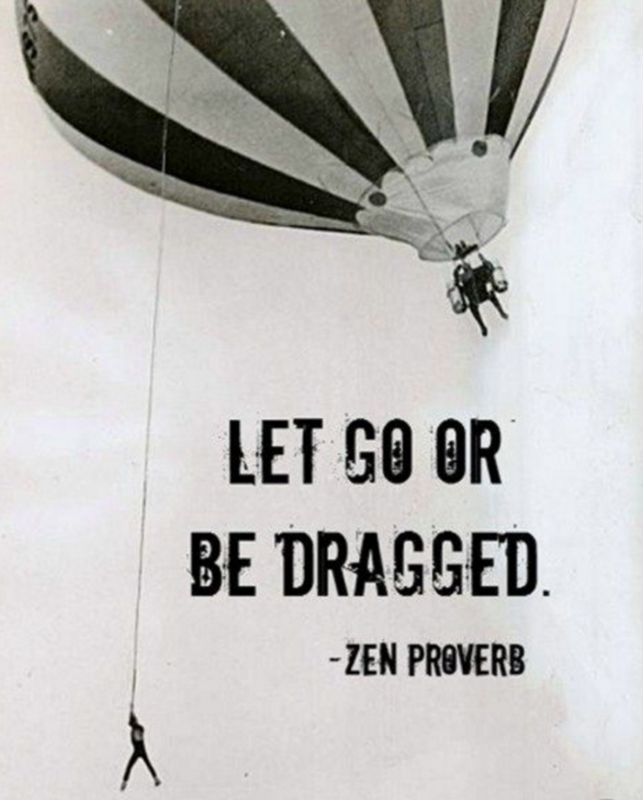 And it is different from giving up – “letting go” is often an action, not a surrender. It is a pre-requisite to stepping forward into a higher awareness. In the Yoga Sutras (as translated by Swami Satchidananda) it states “From this practice, all the obstacles disappear and simultaneously dawns knowledge of the inner Self.” Making the choice to release what is familiar but no longer serving us is a great leap of faith in which you are clearing the way for a greater light, a higher awareness, and a deeper connection to your Divine inner self. Take a moment and take a deep cleansing breath – can you recognize something that is no longer serving you? If so, are you ready to do some conscious internal Spring Cleaning and Let it go?